Beautiful black and white corset with little cute bow. All seams are reinforced with spiral steel bones (Wissner). Corset is perfect for women with breast of big size, as it has low decollete. Dress with wide sleeves together with hooded coat will be a great garb for festival or masked ball. V-type neckline and inner side of sleeves are decorated with thin trim. The boottom hem and the outer side of sleeves are decorated with wider trim. This dress is being made of only natural materials. Different colours are available for order. The belt is not included to the price. .. This example of men's costume is based on original patterns, and you can see it on the medieval engravings of XII-XIII centuries. It will be a perfect outfit for festivals and any other medieval events. Costume consists of: - wide tunic, that is decorated with beautiful trim and is fastened with metal button on the neckline; - wide pants with lacing on the waist. We can make this garb of natural linen or cotton in different colours. The price of medieval costume does not include the belt. .. Such type of garb was popular among polish shliahta and cossacks in XVI-XVII centuries. The costume is made due to historicall patterns and museum pieces. This costume consists of: - shirt with wide sleeves; - wide pants; - wide fabric belt Costume can be made of cotton, linen or wool. Please, send the wished colours to [email protected] ..
Women's undershirt has wide sleeves with cords on its bottoms and cords on the neckline. It is very comfortable for wearing under medieval dress. The undershirt is made of 100% cotton or linen. Different colours are available for order. .. Medieval doublet of XV century with stand-up collar has 13 metal buttons for fastening in front and 10 buttons on the each sleeve. Base price includes lining, made of cotton. The colour of doublet is available for order in options. Please send us the wished colour of lining to [email protected] .. In contrast with sharp, gothic silhouette of Burgundian gown, Italian dress of the XV century was known for its smooth, fair lines. This model of Italian gown is made according to the patterns, which were used by medieval tailors. All unique features of these times are kept: high waistline, square shape of decollete, long bell-bottom skirts, balloon-sleeves of chemise. Presented model of italian outfit consists of few pieces: - Chemise. Loose underwear with wide sleeves is made of thin white batist (100% cotton), which is very soft and nice on the tough to body; - Underdress. Long dress without lining with high waistline, made of decorative jacquard. There are string on the sides of corset part for better fitting. Corset part has cotton lining. - Upper dress (cott) with detachable sleeves. It is made of decorative jacquard, without lining. High waistline, staylace from the front. Sleeves are attached to the sleeve caps with laces. Cuts on the sleeves are bordered with ribbons. Corset part has cotton lining.. This set includes: 1. Cotton eastern tunic 2. Cotton eastern pants Tunic is a typical example of eastern tribes wearing starting from the II century a.d. It preserved its original appearance today in some national costumes of such eastern countries as Mongolia, Kazakhstan, etc. The price does not include the belt. Pants are a typical model of eastern tribes wearing starting from the II century a.d. The pants can be tied on the calves for more comfortable wearing, as the representatives of tribes did it. Pants and tunic are made from cotton. The wished colour combination and other regards, please send us to [email protected] .. 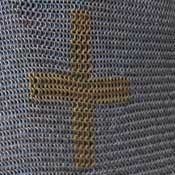 This medieval doublet was made in Burgundian style of the XV century accroding to the historical patterns. Short thight fit doublet is typical for men's fashion of these times. Slim-fit doublet with puffed sleeves is fastened with laces. There are steel points in the ends of laces for more comfortable fastening. Cords are on the sleeves as well. Base price includes linen doublet without lining. Please choose the wished fabric in options. Lining fabric is also available for choosing. All holes for lacing are sewn round by hand. Laces are made in medieval technology. Steel points are handicraft of our craftsmen. Main colour for doublet can be chosen in options. Please see the costume set - Burgundian Men S Suit, XY century ..